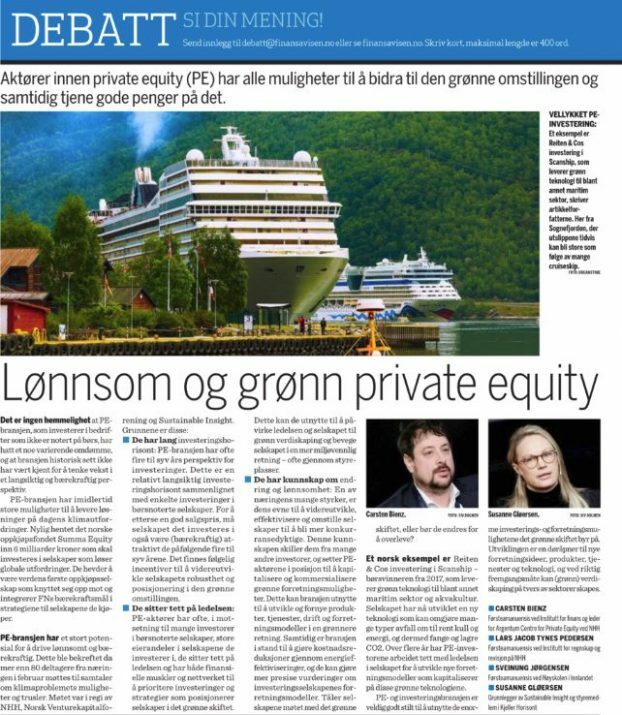 The Norwegian business newspaper Finansavisen wrote an article portraying that Private Equity players have a unique opportunity to invest and bring forward investments within sustainability. We believe that, both now and in the future, winning companies will manage to create value by strengthening the connection between corporate profits and social benefit in both the short and long term. Reiten & Co do not look to exclude companies or industries from our investment universe, but rather continue to identify and analyse the ESG factors that may have an impact on financial performance. This in order to ensure that responsibility is taken for any positive or negative externalities that our business or portfolio company activities may give rise to. We seek to maximize the returns for our investors, while at the same time, we recognize the critical importance of managing assets in a sustainable manner.